Kerr Pump & Supply Controls Product Group specializes in designing and fabricating control systems for a wide variety of water and wastewater applications. 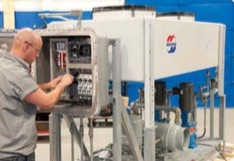 Our innovative engineering team designs complete control systems to meet your specific needs, no matter how unique. 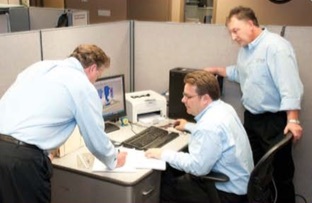 In addition to design and configuration, our engineers provide full documentation (CAD schematics), technical support and field start-up assistance (when requested). With Kerr Controls Product Group in control, you can be confident your project is handled by experienced professionals every step of the way. With over 12,000 square feet of manufacturing space, Kerr Controls Product Group builds all panels to the highest standards. Each stage of the production process, from engineering and design to metal fabrication, layout, wiring and testing, is carried out with precision by our dedicated employees. Each product is fully tested in-house prior to shipment for optimum performance. We are Certified UL Listed and can design and build to your UL508A and UL698A needs. Kerr Controls Product Group has over 18 years of experience, designing and manufacturing control panels in support of our turn-key control system projects. We guarantee strict control of quality utilizing the latest methods, production techniques, equipment and testing. Services included in each control panel project include extensive engineering and design. Pump Panels – Kerr Controls Division for Certified UL Listed manufacturer of custom control panels. Design and build to UL508A and UL698A specifications. Turnkey solutions from concept to completion including hardware design, programming, build, installation and start up. Kerr uses Allen-Bradley, Modicon,GE (90-30, 90-70) and Automation Direct for our PLC platforms. Kerr Controls Product Group’s advanced control solutions for municipal and industrial water and waste water applications utilize the latest technology to meet the expanding demand for drinking water and the stricter regulations on water quality and wastewater discharges. Our dedication to quality, safety, education, and technology provides the foundation for a reliable cost effective control solution. 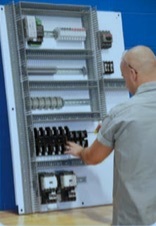 Kerr Controls Product Group offers components along with our control panels from industry leading Rosemount. Transducer that converts pressure into an analog electrical signal. Differential Pressure – Senses the difference in pressure between two ports and produce an output signal with reference to a calibrated pressure range. DP level – provide density and liquid interface measurements. Guided wave radar – sends radar pulse down a probe that extends into the tanks contents. Non-Contact radar – can detect and evaluate all echoes within the tank. Ultrasonic -measure the time interval between sending the signal and receiving the echo to determine the distance to the object. Differential Pressure – measures calculations for pressure inside and outside in different places along a flow path. Vortex Flow meter – used for measuring the flow velocity of gases and liquids in pipelines flowing full. Not familiar with some of these terms? Here are a few of the most commonly used terms explained. Programmable Logic Controllers (PLCs) – Industrial computer control system that continuously monitors the state of input devices and makes decisions. PLC Control Panels – A PLC or programmable logic controller is a digital computer used for automation of typically industrial electromechanical processes such as control of machinery. It is designed for multiple arrangements of digital and analog inputs and outputs, extended temperature ranges, immunity to electrical noise and resistance to vibration and impact. Monitoring Panels and Alarm – These panels provide you with monitoring key readouts and can alert you when something is going wrong. Variable Frequency Drives (VFDs) – Control AC motor speed and torque by varying motor input frequency and voltage. VFD Control Panels – A VFD or variable-frequency drive is adjustable-speed drive used in electro-mechanical drive systems to control AC motor speed and torque by varying motor input frequency and voltage. Motor Control Panels – These panels are designed to start, operate and control a single motor for use in an agricultural or industrial application. Motor Control Centers – A motor control center is an assembly of one or more enclosed sections having a common power bus and principally containing motor control units. Telemetry – Automatic measurement and wireless transmission of data from remote source. Service Entrance Rating (UL) – Interrupts excessive voltage and allows for manually disconnecting form the electrical utility. Reduced Voltage Starters – Uses less energy to start and prevents quicker wear and tear. Multiple Pump Control – Used for to control multiple pumps to maintain consistency and running smoothly.